The Twenty-Third Psalm is timeless. Pastors continue to read it at funerals and related events. It brings comfort to those who weep and assurance for those encountering troubles and difficulties. At times, those who hear it are caught up in an emotional turmoil and some of the deeper truths rush past. Often application arises first before the meaning of a phrase or word, and some of the richness of the passage or a phrase within it breezes by as an after thought. For this reason, in spite of the troubles or anxieties that come to mind when we approach a passage as Psalm 23, focusing on particular phrases and words compel a deeper dive into what the author may be communicating. One important principle for guiding such a reading is realizing that works as Psalm 23 are inspired by God, and the Holy Spirit uses His word as teaching moments about eternal truths. “He restores my soul (Psalm 23:3). That is a curious phrase. Restore suggests that something may have been taken away or became worn down and needed repair. That thought prompted me to seek a Hebrew lexicon to determine how those who spoke the original language treated the word. I was surprised to discover that the word “restore” has multiple meanings in the original language, one of which is bring back from waywardness. The applicable truth is quite simple. When God’s people go astray, He brings them back. The Scriptures throughout affirms this truth. Israel constantly turned away from God, but He promised to return them. The Gospels portray Jesus as the Good Shepherd who keep His sheep and goes after the one that strays (Matthew 18:12-13). In the same way, the portrayal of God as the Shepherd illustrates this same truth. The Bible gives testimony that humanity always goes astray. Even believers in Christ do so. It is within the nature of men and women to wander off from God. Temptation easily captures the mind and heart and takes it down a wayward road. History from the beginning of time illustrates people following their own path. Frank Sinatra used to bellow out, “I’ll do it my way.” Our way is the most traveled path. It is easier and captivates our desires while attempting to fulfill us with pleasures. The psalmist, David, had a very different perspective. He recognized that waywardness for the sheep meant death and destruction. He knew that his own life crossed many destructive and tragic crossroads. When he encountered these crossroads and encountered tragedy, he later recognized the destructive nature of his actions. God restored him. Righteousness suggests a contrast that the sheep have gone the wrong way, and the shepherd took his rod and staff and restored them to the right path (23:4). These implements give comfort, because they lead back to familiarity. The wrong path was a frightful unfamiliar ground full of dangers. The rod is a means of discipline for showing the right way. 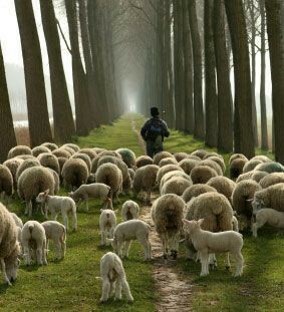 The way of the shepherd is “goodness and mercy,” whereas the way away from the familiar path is evil and harshness. The shepherd is good and merciful. This means that he does not wait for the sheep to return to him. They never will once they are lost in an unfamiliar pasture full of rocks and stubble. He goes after them and restores them to the right pasture, the pasture full of nutrition for the soul (23:5). He guarantees the believer’s safety in this life and the next. Such safety surfaces from God’s grace of soul restoration.